Bravery in the face of certain death is a truly admirable quality in a band. It is something that most bands from the Middle East have to deal with on a daily basis to make a living. Indeed, Al-Namrood knows this struggle as well as anyone, given that they hail from Saudi Arabia. Nobody knows who they are and nobody needs to know. All we need to know is that their style of middle-eastern black/folk is the best in the business. 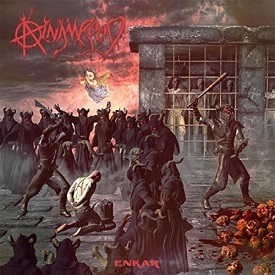 Incredibly, Enkar is their sixth album and the reports are that it features a strong Celtic Frost influence. The reports would appear to be correct as Enkar is much more riff-driven than their past work with slightly cleaner production values. The approach is more stripped down but this is still the AlNamrood fans know and love. The bouncy rhythms are still very much a part of their sound and so is the folk instrumentation. The reverb-infused black metal riffs and tremolo picking of the past are absent on this record. 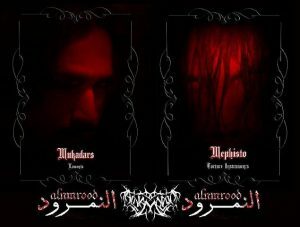 They have been replaced by faster, heavier, grittier riffs that give off a distinct To Mega Therion vibe that is abundantly clear from the first notes of “Nabth.” AlNamrood have always produced great riffs but they were never the focus of their sound. Enkar simply brings those great riffs to the forefront. Much of the lush middle-eastern instrumentation is pushed to the background in favor of the riffs on this album. AlNamrood make it work to their advantage though because when it is used, it adds tremendous depth and variety to the songs. This is especially effective on the instrumental “Egwaa” as well as “Ezdraa,” which really exemplifies AlNamrood’s new approach and why it works quite well for them. The closing track, “Entiqam,” might actually be the best track on the album as it contains great riffs, a bouncing melody, and plenty of folk instrumentation. It actually sounds like a classic AlNamrood track but with heavier riffs and crisper drumming, which is a good thing in this case. The drumming on this album is perhaps the most significant departure from the band’s trademark sound. Specifically, Enkar is mostly devoid of the wonderful percussion AlNamrood have always employed. The only time it comes in is on the gorgeous instrumental, “Egwaa.” This album continues the trend of getting away from the black metal standards of endless blast beats and double kick found on Diaji Al Joor, only employing double kick in the closing track. The speed is still there but it is much more bombastic this time around. The fun filled alternating bounce beats are still there so as always, this album has a significant “fun” quotient that really enhances the band’s sound. 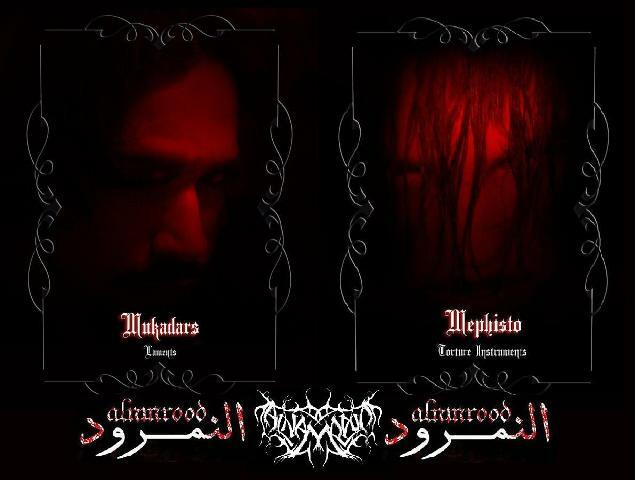 AlNamrood’s vocals have always been incredibly unique. At times, they use black metal screams and at other times, it sounds more akin to Arabic chanting. This time around, the approach is a little different, which only makes sense given the change in sound. Humbaba’s vocals are significantly more aggressive and shouted than in the past. Most of the time it befits and benefits the music but there are moments when he sounds like a dying cat. Somehow though, it plays into the atmosphere of the album despite making listeners cringe. Even the chanting sounds more aggressive and is done in a slightly lower register on tracks like “Ezdraa” but it actually works well for the album’s style. Any time a band significantly changes their style, it is likely to be polarizing among the fans. This album may be an exception since many elements of AlNamrood’s signature style remain intact, just with some significant variation. Experimentation is a tricky thing for well-established bands but these guys did it the right way. They took the core elements of their sound and figured out a new way to highlight those elements by expanding upon the base. That is a recipe for success and although Enkar may not be AlNamrood’s best album, it is certainly a successful experiment that produced yet another high quality album. This entry was posted in Black Metal, Folk Metal, Reviews and tagged 2017, AlNamrood, black metal, Black/Folk, Celtic Frost, Enkar, folk metal, Saudi Arabia, Shaytan Productions, To Mega Therion.